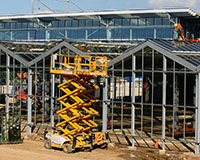 Scissor lifts are useful in many industries. From warehouse applications to construction work, a scissor lift is extremely capable of helping people accomplish tasks in a safe and professional manner. Scissor lifts are a type of boom but, unlike the telescoping and articulating counterparts, a scissor lift can only move in a vertical motion. The scissor lift has a large working platform that is raised and lowered by hydraulically operated intersecting supports. Equipment Rental Direct has all of the information you need to find a scissor lift rental that will help improve efficiency on each project. Window Washing - Large, high windows must be kept clean for the most professional representation of a company. Scissor lifts provide a quick way for laborers to clean windows indoors and out. Interior Maintenance - A scissor lift allows maintenance workers in shops and warehouses to safely change light bulbs on high ceilings, patch ceiling holes, perform fire suppression system testing, repair overhead plumbing, maintain exhaust fans, and install new fixtures or wiring. Exterior Maintenance - Repairs to brickwork, windows, eaves, and other high areas of a building are accomplished rapidly with the help of a scissor lift. Interior and Exterior Painting - Scissor lifts can raise painting professionals and their supplies to vertical heights of 50 feet or more, eliminating the need for unsteady scaffolding. 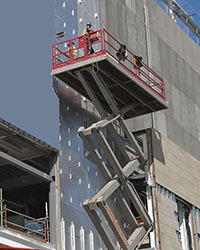 EIFS and Stucco Work - EIFS and stucco materials are heavy, so using a scissor lift with a high weight capacity means workers can transport bags of Portland cement and aggregate to extreme heights without the risk of back and shoulder strain. 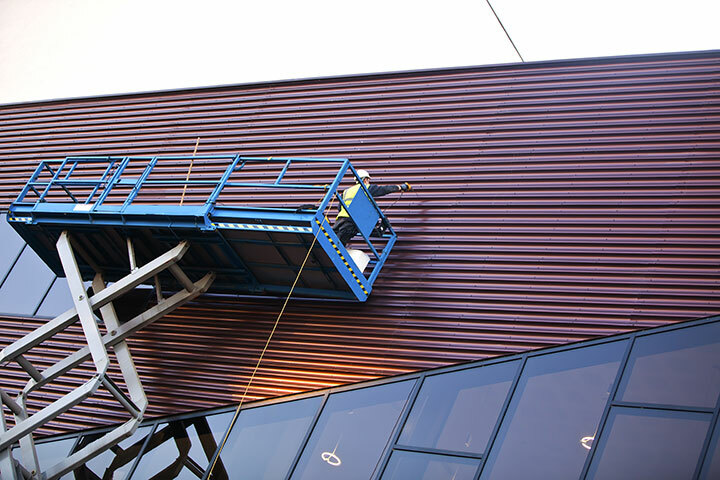 Siding Installation - Installing siding is more efficient when workers have access to a scissor lift. The scissor lift lets employees move along the installation path without pulling down and re-erecting scaffolding. Landscaping - Scissor lifts give landscapers more working area than a bucket truck, which is convenient when pruning trees. Bridge Work - Due to the weight of materials, workers often use a sturdy scissor lift when constructing bridge pillars. There are two main types of scissor lifts. The first is called a slab scissor lift and the second is a rough terrain scissor lift (generally gas. The type of scissor lift you need depends on how you will be using it. 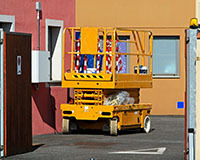 A slab scissor lift is also known as an electric scissor lift. This type of lift is used primarily indoors, but can be used for outdoor applications as long are there is a flat, slab-like surface on the ground. It has very low emissions because it is powered by electricity, so using a slab scissor lift indoors has minimal effect on air quality. While smaller than the rough terrain scissor lifts, the electric lift still has the ability to heft up to 1,500 pounds. Additionally, it can reach working heights of up to 46 feet. A rough-terrain scissor lift is a more rugged machine than the electric-powered slab lift. With the capability to lift a combined weight of 2,500 pounds to heights of around 59 feet, the rough terrain scissor lift is a workhorse. This type of lift is powered by a combustion engine, so it is not as optimal for indoor use. These lifts can be used in exterior applications where the ground is somewhat level, though the area need not be finish-graded. Since scissor lifts are useful in so many varied applications, there are numerous sizes available for rental. From smaller electric lifts better suited for light maintenance to large lifts appropriate for working in less than desirable conditions, Equipment Rental Direct makes finding the perfect scissor lift for your next project easy. The following chart shows a small example of the common specifications for scissor lift rentals. Choose the right scissor lift for your application based on the mandatory platform height, the number of workers you will need in the space at one time, and the amount of combined weight you are required to lift. Keep in mind that many scissor lifts also have platform extensions available. These add additional working space to your platform; however, they can only hold a fraction of the weight capacity. If you require a larger platform for additional working space and the ability to lift people as well as materials, consider renting a bigger machine than you think you might need. Scissor lifts help get the job done quickly and safely so your workers are able to move on to the next task. Starting around $100 per day, your next project can go on without the need for fussy scaffolding or rickety plank and ladder systems. Let Equipment Rental Direct help you find affordable scissor lift rentals for your next project.